It may be beneficial to re-read the first blog on Pericoronitis that was posted on July 21st, as it may help in better understanding this one. As mentioned previously, there is a cyclical nature to the acute and chronic states of Pericoronitis. In time, the amount of gum/bone (tissue) destruction escalates. Inflammation of the soft tissues results in an active infection, pus, abscess, cellulitis (this is when the infection travels through the soft tissue spaces of the head/neck) and accompanying fever, malaise, swollen lymph nodes in the neck in addition to the spread of infection to ‘potential’ spaces which can compromise an individual’s airway making it difficult for them to swallow (dysphagia) and breath (dyspnea): as seen with Ludwigs Angina. The image above shows an individual who has Ludwigs Angina. The tooth related infection has become so severe it has spread to the soft tissue spaces of the neck. 1) Medication: Pain management with over-the-counter medication such as Tylenol (acetaminophen) or Advil (ibuprofen). – There are also gels in the form of lidocaine which can be topically applied to the area…..this would provide a numbing effect. – One can also treat with an antibiotic such as penicillin or clindamycin; however this practice should be limited: Over prescribing antibiotics can result in ‘antibiotic resistance’. 2) Debridement: Cleaning out of any plaque, calculus, food debris that has accumulated under the operculum flap. This is accomplished in the dental office, usually by the dental hygienist. 3) Rinses: These may be used to help clean out the area underneath the flap…. They include warm saline (salt water), hydrogen peroxide, chlorhexidine rinse and antiseptics. 4) Smoothing: out of a pointy cusp tip on an opposing tooth which contacts the operculum (please see the last blog which was posted on July 21st, 2015 ). 5) Removal: of the partially impacted wisdom tooth. 6) Gingival Excision: Removing the operculum (flap of tissue) is often attempted however it is not always an effective treatment. 7) Surgical Drainage of the area. As mentioned previously, this is often necessary if the swelling has spread to the soft tissue spaces. 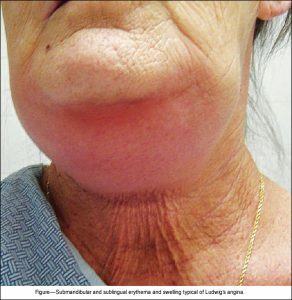 In many instances, the patient ends up having to go the hospital if the swelling is severe enough and the patient is showing systemic signs and symptoms (see above image). The key to prevention is to remove impacted third molars before they erupt into the mouth or by removing the operculum (operculectomy). The pain that accompanies Pericoronitis can often be confused with that of Temporomandibular Joint Disorder (TMJ). We will discuss this in the next blog…..until then!